Catheter Tipping Dies | Cath-Tip, Inc.
Our superior catheter tipping dies are made from high-density carbide for extended production life and designed to deliver flashless tips. Tipping dies can be manufactured to create most any geometry desired for medical catheter tip applications. Tipping dies are mounted in a water-cooled block with a quick-change thread-in, thread-out design. Our carbide dies are extremely durable and resistant to wear from production cycles and cleaning operations. 1. 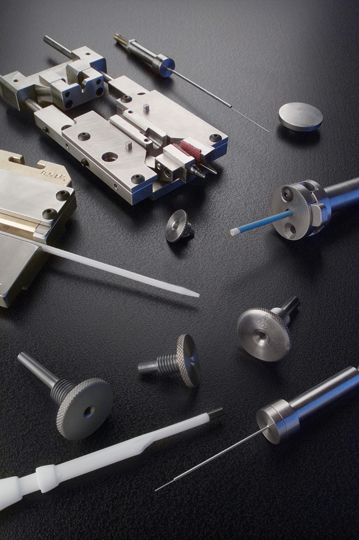 We can begin the process for you by forming sample parts using our existing dies, whether you need simple tip forming, complex tip forming, flaring, flanging, or bonding. 2. Then we’ll manufacture a die to your specific geometry, incorporating Cath-Tip® proprietary design features. 3. From this we can supply engineering samples for qualification studies. 4. We can then continue to supply parts run at this partner contract medical manufacturer, OR we can supply a tipping machine with tooling mounted and parameters set so all you have to do is uncrate the machine, plug it in, and start making parts!